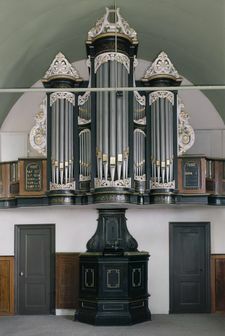 Pulpit and Organ, Doopsgezinde Kerk, Irnsum. Photo by Paul van Galen and Kris Roderburg, Rijksdienst voor het Cultureel Erfgoed. Irnsum, is a town in the Dutch province of Friesland, about 13 km (eight miles) south of Leeuwarden. Mennonites were found here at an early time, at least before 1600. In the 17th century there were in Irnsum two congregations, one of which died out about 1740; nothing more is known about it. The other, congregation, with a baptized membership of about 75, joined the Mennonite Conference of Friesland in 1695. Shortly before, in 1684, it acquired a meeting­ house with some stained glass windows, which was an exception in Mennonite meetinghouses. In the 18th century it united with the Poppingawier congregation. In 1838 the membership of Irnsum and Poppingawier numbered 83; in 1871, the membership having increased to about 160, it was de­cided that each congregation should be independent, but served by the same preacher. The old church of Irnsum was remodeled in 1837, 1848, 1866, and 1940. 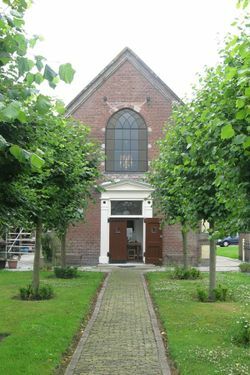 The last lay preachers of the congregation were Sipke Jelles van Teerns, serving 1804-1829, a baker, who received a small remuneration, and Durk Gerbens Visser, a retired farmer, in 1829-1836. The first trained minister, educated at the Amsterdam Mennonite Seminary, was Izaak Molenaar, who served here 1837-1878. The later ministers were J. Pottinga Hz. 1880-1886, H. J. Elhorst 1887-1888, J. S. Pekema 1889-1891, M. L. Deenik 1892-1897, R. van der Veen 1897-1902, Iz. Hulshoff 1903-1914, H. J. Woelders 1915-1917, P. A. Vis 1918-1930, M. van der Meulen 1935-1939, A. J. Snaayer 1940-1944, H. R. Keuning 1948- 1950, Miss J. W. Zuidema 1951-1954, and H. Annema after 1954. The parsonage was built in 1838 and enlarged in 1852. The baptized membership of Irnsum was 114 in 1954 and Poppingawier 41. Church activities in the mid-1950s included a Sunday school for children, Menniste Bouwers (youth association), young members' group, and a ladies' circle. Hoop Scheffer, Jacob Gijsbert de. Inventaris der Archiefstukken berustende bij de Vereenigde Doopsgezinde Gemeente to Amsterdam, 2 vols. Amsterdam: Uitgegeven en ten geschenke aangeboden door den Kerkeraad dier Gemeente, 1883-1884, II, 2, No. 221. Cate, Steven Blaupot ten. Geschiedenis der Doopsgezinden in Friesland. Leeuwarden: W. Eekhoff, 1839: 168, 189, 247, 306. Naamlijst der tegenwoordig in dienst zijnde predikanten der Mennoniten in de vereenigde Nederlanden. (Amsterdam, 1829): 54 ff. Doopsgezinde Bijdragen (1870): 139-160; (1872): 190 ff. Hege, Christian and Christian Neff. Mennonitisches Lexikon, 4 vols. Frankfurt & Weierhof: Hege; Karlsruhe: Schneider, 1913-1967: v. II, 438. Zijpp, Nanne van der. "Irnsum (Friesland, Netherlands)." Global Anabaptist Mennonite Encyclopedia Online. 1957. Web. 20 Apr 2019. http://gameo.org/index.php?title=Irnsum_(Friesland,_Netherlands)&oldid=145491. Zijpp, Nanne van der. (1957). Irnsum (Friesland, Netherlands). Global Anabaptist Mennonite Encyclopedia Online. Retrieved 20 April 2019, from http://gameo.org/index.php?title=Irnsum_(Friesland,_Netherlands)&oldid=145491.